We all know that perfectly straight teeth look great, but did you know that they tend to be much healthier as well? Properly aligned teeth are much easier to clean while brushing and flossing, leading to a smile that looks just as good as it feels. If you or your child have crooked, crowded, or gapped teeth or bite alignment issues, then Dr. Swearingen is prepared to offer the solution you need. We have treatments that are perfect for smiles of all ages, so if you’re ready to set your teeth straight, contact us today. 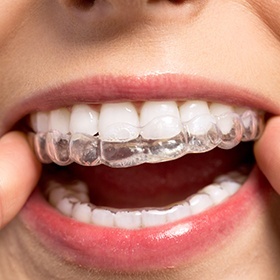 When we say traditional orthodontics, we are of course referring to metal braces. They are still the most reliable, effective, and affordable treatment available today, capable of handling alignment issues ranging from simple to complex. They work like they always have: a specially bent wire is used to apply a gentle force to the teeth that gradually shifts them, and this wire is held in place using brackets bonded to each of the teeth. With them, we can address everything from minor teeth alignment issues to systemic jaw problems. 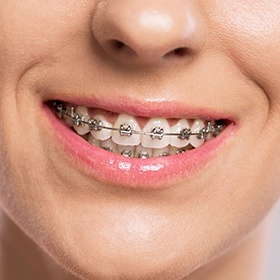 While you may think you’re familiar with how braces look, that aspect has changed quite a bit over time. Now, they are smaller, sleeker, and more comfortable than ever. Their durability makes them perfect for young children, and they can be trusted to work for adult smiles, too. With traditional braces, a beautifully straight smile is all but guaranteed. If you’re looking for an orthodontic treatment that won’t affect your daily appearance or habits, then Invisalign ® is for you. 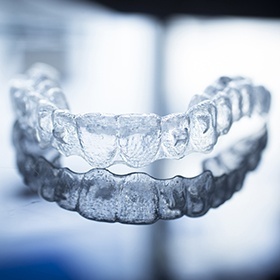 Instead of brackets and wires, it uses a series of custom-made clear plastic aligner trays to shift the teeth in the most discreet and comfortable way possible. The trays are practically invisible to the naked eye, and they are also easily removable, meaning you can maintain your regular diet and brushing habits while getting the smile you’ve always wanted. ClearCorrect ™ is an aligner system just like Invisalign, but with one major difference: ClearCorrect ™ is 100% made here in the U.S. This tends to make it a bit more affordable for our Oklahoma City patients. It is still extremely effective at straightening the teeth, and it also provides a subtle solution that won’t affect a person’s natural appearance. Basically, with ClearCorrect ™, the only thing people will notice about your treatment are your beautiful results.